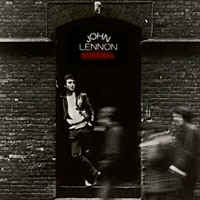 The "Rock 'N' Roll" album, consisting entirely of cover versions of rock standards, was John Lennon's tribute to the rock 'n' roll of his youth. The project was almost scrapped because producer Phil Spector initially refused to turn over the session tapes to John. Eventually, the tapes were returned and the album was released Feb. 17, 1975 (US) and Feb. 21, 1975 (UK). BE BOP A LULA, I DON'T MEAN MAYBE. BE BOP A LULA, SHE'S MY BABY LOVE, MY BABY LOVE, MY BABY LOVE. BE BOP A LULA, SHE'S MY BABY LOVE, MY BABY LOVE, MY BABY. SHE'S THE ONE WHO WANTS ME MORE, MORE, MORE. SHE'S SURE MY BABY LOVE. FOOL ABOUT MY MONEY, DON'T TRY TO SAVE. MY HEART SAYS, "GO! GO! HAVE A TIME!" PICKED HER UP IN MY EIGHTY-EIGHT. From the album "Rock 'n' Roll"
IT WAS A CUSTOM MADE, IT WAS A FLIGHTNING DEAL. YOU KNOW I'M GOIN' LIKE COOL BREEZE. I WAS ROLLIN' SLOWLY 'CAUSE OF DRIZZLE SHOWERS. THEN COME WAVING GOODBYE IN A LITTLE, OLD SOUPED UP JITNEY. MOANIN' SIREN, 'TWAS THE STATE PATROL. I'M GONNA NAME YOU MAYBELLENE. RADIO TUNED TO ROCK AND ROLL. GIT IT ON, GIT IT ON. YOU BROKE MY HEART WHEN YOU SAID WE'RE PART. FAREWELL, GOODBYE, ALTHOUGH I'LL CRY. KISS AND SQUEEZE, YEH, YEH? WELL, (do you) DO YOU, (do you) DO YOU (wanna dance?) DO YOU WANNA DANCE? (Do you) DO YOU, (do you) DO YOU (wanna dance) DO YA? DO YA? (Baby) BABY (do you wanna dance?) DO YOU WANNA DANCE? ON DOWN TO FRISCO BAY. SHE'S SPORTIN' HIGH HEEL BOOTS-AH. PLEASE, PLEASE MAY I GO? SOME OTHER STEAL THE SHOW. BEEN TOLD A LONG TIME AGO-HO. PRETTY, PRETTY, PRETTY, PRETTY PEGGY SUE. YEH, (yeh) YEH, (yeh) YEH. BUT NOW I KNOW, I'VE ONLY HURT MYSELF. YEH, (yeh) YEH, (yeh) YEH, YEH, YEH. UNTIL I'M DEAD AND BURIED IN MY GRAVE. MY NIGHTS ARE SO BLUE. SHE'S AS SKINNY AS A STICK OF MACORONI. JUST EXACTLY WHAT I'M GONNA DO. MAKING LOVE UNDERNEATH THE APPLE TREE, HEY! WELL, SHE'S MY ONE AND ONLY, SHE'S MY HEARTS DESIRE. WAITIN' FOR THE YA YA, AH HA. DON'T MAKE ME WORRY, AH, AH, AH. WAITIN' FOR THE YA YA, AH, AH, AH. DON'T MAKE ME WORRY, NO, NO. ALWAYS THINKIN' OF YOU, YEAH, YEAH.